Product categories of Shaking Table, we are specialized manufacturers from China, Shaking Table, Vibration Shaker Table suppliers/factory, wholesale high-quality products of Small Gold Shaker Table R & D and manufacturing, we have the perfect after-sales service and technical support. Look forward to your cooperation! 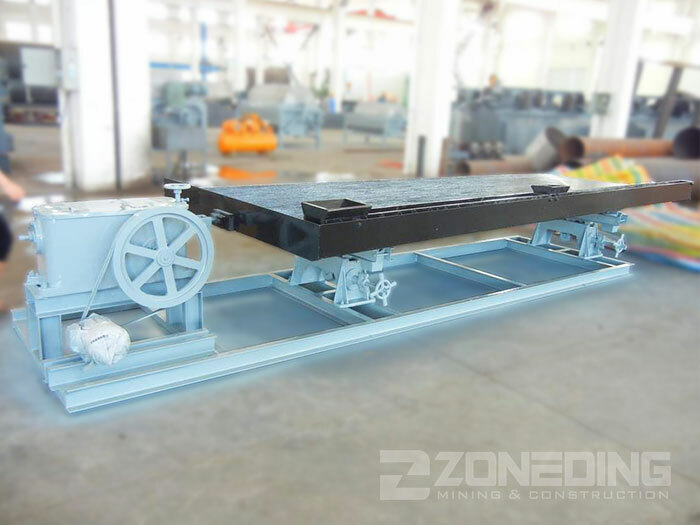 Shaking Table is one of most commonly used mineral Beneficiation Equipment, although the processing ability based on unit area of shaking table is low, its effective particles size sorting could be up to 0.037mm limit, the interval grill of table surface is very clear and machine operating is easy. Shaker table could continuously sort concentrate ore, second-grade ore and tailings, it is very important ore sorting equipment. Shaking table is made of machine head, motor, adjusting gradient device, bed, bunker, water tank, rifle bar and lubrication system. 1. Great ratio of high-grade ore, high separating efficiency, easy to operate and convenient to adjust the stroke.